In our ongoing effort to make StogieGuys.com as entertaining and informative as possible, each Friday we’ll post a mixed bag of quick cigar news and other snippets of interest. We call ‘em Friday Samplers. Enjoy. 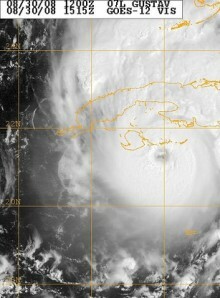 1) Hurricane Gustav did some major damage to Cuba on August 30. According to reports, “winds of 140mph crashed into the western edge of the Caribbean island where much of the country’s vital tobacco crop is grown.” Gladly, Cigar Aficionado reports it was too early in the season for tobacco plants or seedlings to be in the ground; more importantly, the government reported no deaths due to the storm. 2) Yesterday marked the beginning of a new smoking ban for “all places of business” in Wichita, Kansas—unless you’ve got a government-issued smoking permit, that is. City bureaucrats were nice enough to post some of the red tape here. 3) Kansas City has been at the mercy of a Draconian smoking ban since April but, much to the chagrin of one anti-tobacco editorialist, the City Council is looking to ease some of the law’s oppressive restrictions. In a very modest improvement, they’d like to once again permit smoking in retail tobacco shops—a move you’d think even the most ardent smoke-hating zealots could live with. 4) Inside the Industry: Chicago-area readers may be interested in Stogies and Bogies, a combination cigar show/golf outing. Davidoff is introducing the Maduro R. Felipe Gregoria opened the Casa Felipe store in Miami, a cigar and wine lounge in the heart of Little Havana. 5) Around the Blogs: Cigar Jack reviews an Alec Bradley Tempus. Stogie Review smokes an Alec Bradley Maxx Vice. Keepers of the Flame lights up a La Riqueza. Matt smokes the Padilla 8/11 Miami. 6) Deal of the Week: I don’t really know why this is called the King Sampler, but it does include 10 top notch cigars for $34. Included are sticks from Romeo y Julieta, Fonseca, Cusano, La Aurora, Aroma de Cuba, CAO, and Don Pepin. Grab yours here. While in Pinar del Rio the crops were not in yet and no one was hurt. 1,000 tons of tobacco that was in drying barns in the region was damaged.